This is an unused, factory fresh, genuine Burroughs (possibly a C-2503-3) three digit B5750S Nixie tube type counter with decoder driver circuit card kit. 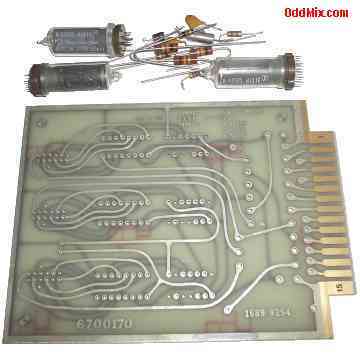 It uses standard TTL (Transistor Transistor Logic) BCD (Binary Coded Decimal) input logic signal. The high quality, factory built PCB comes with gold plated 30 pin edge connector. The unit requires 5 Volt DC (Direct Current) and 200 Volt DC for its operation. It was made by the now defunct Burroughs Corporation's Electronic Components Division (ECD Plainfield NJ) around 1968-1970. Many equipments from the seventies, DMMs, Frequency Counters and others, used these standard Nixie tube assemblies to display their readout. Excellent as a replacement, or for new projects. It can be used especially well for making a frequency counter or a simple DVM with a high quality digital display. This is a real hard to find vintage collector's choice item. Only one available.